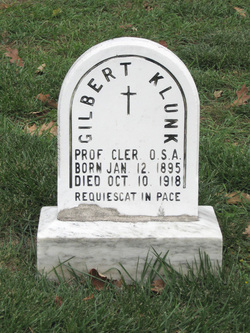 Gilbert Francis Klunk was born in McSherrystown, PA on January 12, 1894, to Francis X. Klunk and Emma Jane Dietrich. He was one of eleven children. Three of his sisters entered the Congregation of the Sisters of St. Joseph of Chestnut Hill. Gilbert was educated in his home town and worked there as a grocery store clerk. He entered the novitiate at Villanova, PA on June 15, 1918, and died four months later, at 1:30 in the afternoon of October 10th, a victim of the world-wide influenza epidemic that killed more than 19 million persons. Gilbert was professed on his deathbed at the age of 24, the first of three professed clerics to die in the epidemic. He was buried at Villanova in the Community Cemetery on October 13, 1918, and was survived by his parents and six of his siblings. Newer Post Charles L. Knapp, O.S.A. Older Post John A. Klekotka, O.S.A.